If you happen to use both Skype and Facebook, then you can easily expand your Facebook network with Skype friends. 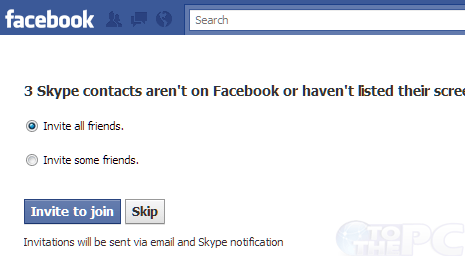 Facebook’s find friend feature allows you to search your Skype contacts not on Facebook. You can selectively invite Skype friends to join and network with you Facebook. 1. Open Find Friends page on Facebook. Login into your Facebook account. 2. Scroll down to bottom of Find Friends webpage and look for “Find people you IM”. 3. Click on Skype option and you should see login boxes to enter your Skype username and password. 4. Enter your Skype accout login details and click ‘Find Friends’ button. 5. Next screen with authenticate your Skype account and list Skype contacts or friends not on Facebook. 6. You can invite all friends or selectively invite few friends by clicking ‘Invite to Join’ button. 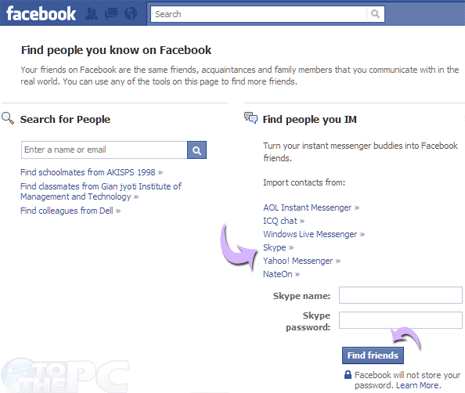 Invitations to join Facebook will be sent via email and Skype notification to friends listed on find friends screen. For sure one quick and easy way to expand your Facebook network with known contacts from Skype network.